Look for informative and actionable articles from Brad Harris and Shawn Dinning, consultants who know airplanes and answer questions about buying and selling airplanes with . . . straight answers. We welcome your questions and comments about the purchase and sale of aircraft. Mr. Dinning acquired his formal education at the United States Air Force Academy in Colorado Springs, Colorado, in the areas of Operations Research and Management Science and also holds a degree in Aeronautical Science from Embry-Riddle Aeronautical University. Mr. Dinning brings 15 years of aviation experience from a variety of aviation disciplines, including FAR 91, FAR 121, FAR 135, defense, and shared ownership sectors. A former full-time professional pilot, Mr. Dinning holds a current Airline Transport Pilot (ATP) certificate, and is type-rated in the Challenger 600 and Citation 510 Mustang. He has logged over 5000 flight hours, with 3500 of those hours in corporate turbine aircraft. Mr. Dinning has been consulted in publications such as Business & Commercial Aviation on various issues related to turbine aircraft transactions. Mr. Dinning brings to Dallas Jet International a rare and highly valuable skill set, and has become a leader in the professional marketing and procurement of corporate turbine aircraft all around the globe. He also specializes in aircraft mission analysis, aircraft valuation, and cash flow and operating cost analysis for private aircraft owners. Mr. Dinning has a track record of successful transactions that is well known amongst his clients and colleagues. 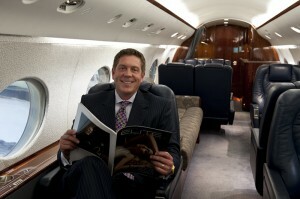 His reputation for intelligent and meticulous management of aircraft transactions have made him one of the most respected aircraft brokers in the industry. You are currently browsing the Aircraft Sales Insights blog archives for December, 2010.